Document, file and print your Stamped Schedule 1 in as little as 15 minutes, helping you get back on the road fast. 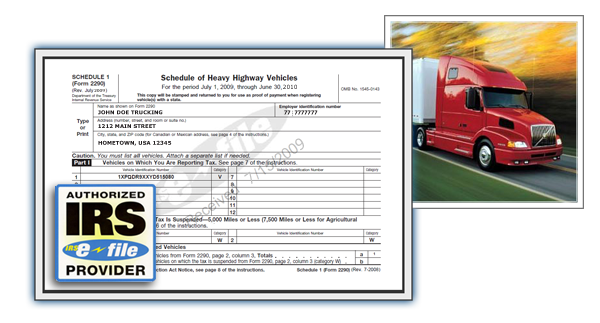 Fast2290.com makes filing your Form 2290 Heavy Vehicle Excise Tax forms quick and easy. Our technology centric approach, backed by great customer support, makes your experience one to remember and gets you back on the road as fast as possible. We have been in business for over 7 years, and during that time we've serviced thousands of customers just like you. We'll help you input, calculate and electonically file your 2290, ensuring your filing is done right the first time, saving you valuable time and money. Don't waste your time trying to file your 2290 taxes yourself. Let our systems ensure the accuracy of the information, submit the filing electronically and save the results for your review. What has traditionally taken weeks to complete, can now get accomplished in minutes!